We had a very nice young couple come to visit us last weekend from Bologna, Flavia and Gabriele. I had met Flavia last year, she and my husband were part of the same team organising an event called ‘Festival della Medicina’. The event proved so successful and popular that it is being sequelled this year and my husband pops up to Bologna not infrequently for meetings and all the rigmarole and networking and preparation and background due diligence that an event such as this occasions. Anyway, the long and the short of it is that he invited Flavia and her husband to spend a weekend with us so they could take some time off and visit Rome. For my part, I wanted to prepare some food that would be typically Roman for them to enjoy. Bologna is big on food as we all know (! ), so there was an impish part of me that wanted to show them that Lazio is no slouch in the cuisine department … and what better way to wow them than with artichokes, carciofi, that are at their peak just now? Good move on my part, no surprise there. I fried some slices of artichoke dipped in flour and beaten eggs (carciofi fritti dorati alla romana) and also cooked carciofi alla romana. I also made a simple recipe colloquially called ‘broccoli ‘mbriachi’, i.e. drunken broccoli. The reason for the sobriquet is naturally to be sought in the addition of wine to the cooking process. 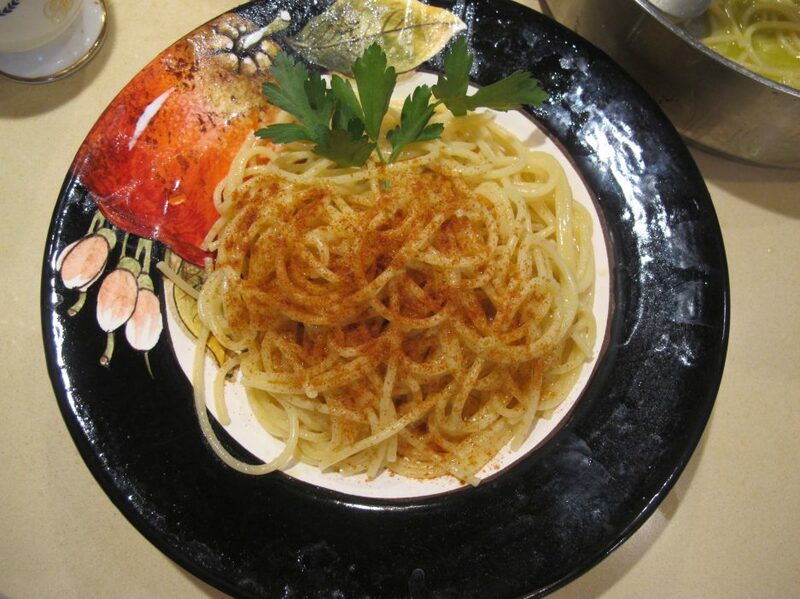 And it is a typical dish of the Castelli Romani area, where we live. When I was at the greengrocer’s, the Masi family-run shop in Frascati, their daughter told me that her mother made the best broccoli mbriachi with an emphatic appreciation that was difficult to ignore. This not unnaturally aroused my curiosity and made me venture to enquire further. And that is when I discovered that I had been making this recipe all ‘wrong’ all the time! I used to simmer the broccoli for a bit and then add the wine. Uh uh, that is not the way. The broccoli need to be cooked in the wine from the very start. What an aha! moment for me. The other aha! surprise was that this dish turned out be Flavia’s favourite (not that she didn’t like the carciofi). So there you are, you live and you learn. Always. Thank goodness! How boring otherwise it would be. Then, roughly slice the florets. Dribble (my new word … apparently ‘drizzle’ is rubbish, and we’ve all being saying ‘drizzle’ for so long now, but it’s just plain ‘wrong’. The rain drizzles. When we pour a larger quantity than the rain that drizzles, then what we are in fact doing is ‘dribbling’. Except, and I don’t know about you, the word ‘dribble’ makes me think of people or children who can’t keep their saliva in their mouths, not at all attractive, if you know what I mean). Where was I ? oh yes. Dribble a good amount of olive oil, add plenty of garlic (the more garlic cooks, the less pungent it becomes, so have no fear) and … if you like a bit of spice … do add some chilli flakes. Turn on the heat and cook the garlic until it goes golden in colour and then add the sliced broccoli florets. Cook them like this for a minute or two … Have some red wine at the ready … And pour a prodigious amount over the broccoli. The wine has to cover the broccoli completely. We are sozzling here, folks! That’s the spirit! And do sprinkle some salt. No salt, no taste. Cover with a lid and cook over a medium flame. This is what it looked like after 30 minutes. Exactly the same, to be honest. But I added a bit more wine. And continued to cook it with the lid on. And this is what it looked like after one hour. The consistency was fork tender, just this side of ‘mushy’. This is how it is supposed to be, by the way! Non of this ‘crisp’ vegetable stuff. And … as I say .. Flavia couldn’t get enough of this drunken veggie! I couldn’t resist inserting this photo of a lonesome carciofo alla romana standing to attention … looks rather like it could be part of the candle stick, tee hee.